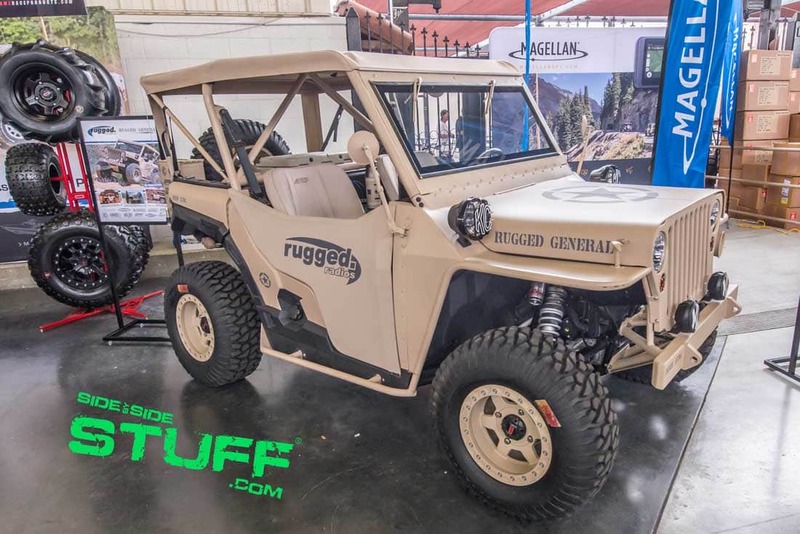 Rugged Radios is known for doing some of the coolest UTV builds in the industry, they never cease to impress us with over the top attention to detail and unique customization. To no surprise their latest custom build was no exception. At the 2017 Sand Sports Super Show we met with Greg Cottrell, owner of Rugged Radios. Greg was super excited to show us their one of a kind “Rugged General, a Willys Jeep inspired Polaris General 1000. 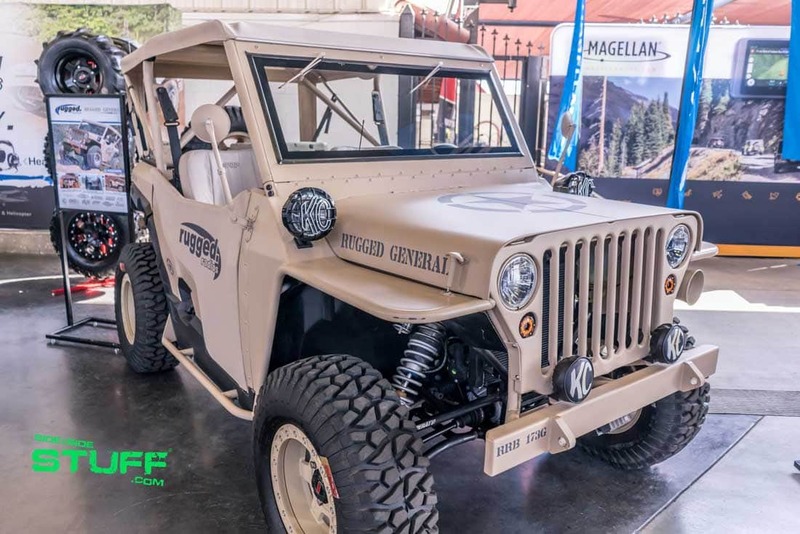 Rugged Radios took new Polaris General and stripped it down, with the help of NVFab in Grover, CA, they took an original ‘41 Willys Jeep front end and fashioned it to fit the General’s frame. The Willys front end includes an original grill, hood and flip down glass windshield with original hand-crank windshield wipers. Many other details where custom fabricated including the flat fenders, cage and canvas doors. Attention to detail is Rugged Radios’ forte, on the Rugged General you’ll find 20 mm bullet shells for grab handles, grenades for the shifter and dump bead handle, an air raid siren, an angle finder, a military ammo can speaker, a military ammo can storage container to hold gear as well as an ax and shovel like you would find in a military jeep. To no surprise, a wide variety of aftermarket UTV parts and accessories went into this build. For suspension, they went with Walker Evans shocks, a Super ATV 3” High Clearance Lift Kit, Super ATV Rhino Axles and Super ATV 1.5” Forward A-Arms to fit the big 32” GMZ Ivan “Ironman” Stewart Edition tires on 15” GMZ Casino Beadlock Wheels. Inside, PRP Seats customized some canvas low-back seats to really give it that jeep feel. 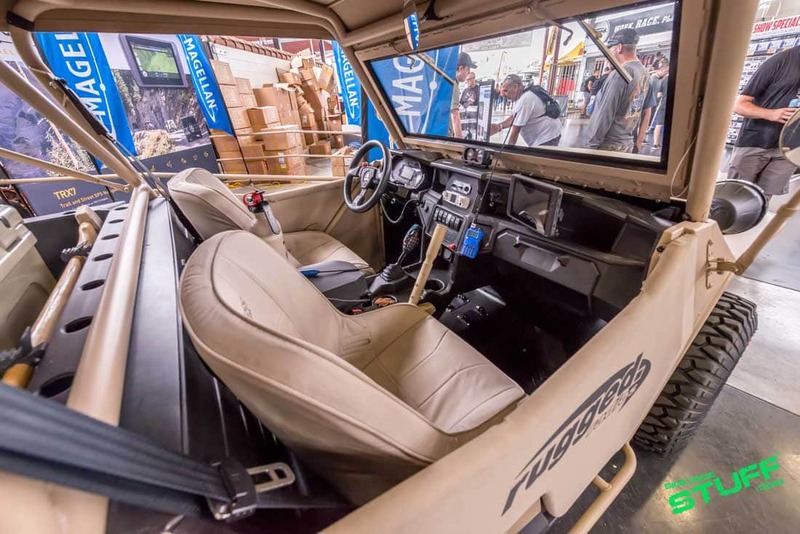 The interior is also loaded with goodies like a Magellan GPS, Assault Industries Steering Wheel and Fire Extinguisher and of course a Rugged Radios RRP660 Plus Bluetooth Intercom and RM50-MB 50-Watt Multi-Band Radio. Greg also installed an XTC Turn Signal Kit to make it street legal. Rugged Radios definitely killed it on this build. Truly unique, this Willys Jeep style custom Polaris General is definitely a head turner; you just won’t see another one like it. It may be hard to top this one, so we are really looking forward to seeing just what Rugged Radios will build next. Being able to communicate with your passengers or with another UTV in your riding group is pretty convenient, but beyond convenience, it can be extremely helpful in a moment of urgency. 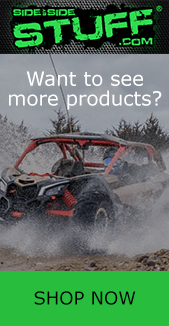 The leader in UTV communications, Rugged Radios offers the simple solution to adding this perk into your side by side with communication systems for UTVs. At Side By Side Stuff, we offer a variety of Rugged Radios products including Intercom System Kits and Car to Car Communication Kits. Browse our Rugged Radios brand page today and find the system that is right for you. HOW MUCH FOR THIS GENERAL? 26 MARCH 2018, I WILL BE 80 YEARS OLD, AND I’D LOVE TO HAVE THIS GENERAL, TO RUN UP AND DOWN US-19! YES, I KNOW I CANNOT AFFORD IT BUT, HOW MUCH?